As soon as I saw the new Google Calendar command line interface I decided to give Google Calendar another chance. Previously, I had ditched it in favor of Backpack--I tried using both for sending myself timely SMS reminders and found that the Backpack Dashboard Widget made entry easier. I like not having to go to a web page to do something like create a reminder for myself if I can help it. I went back to give Google Calendar another shot when the command line interface came out because I knew it had an awesome "Quick Add" feature which allows you to enter reminders like "7:30pm tomorrow get a beer with EJ"--much faster than using dropdown menus. 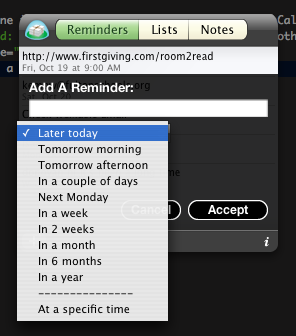 I got everything setup nicely, and I have to say that capturing reminders is even easier than with the Basecamp widget. One of the first things I tweaked before I even started messing with gcalcli was my Google Calendar notification settings. Go to Google Calender and click the dropdown next to your default calendar in the left pane and choose Notifications to change your reminder settings. I chose to have events default to sending me an Email and SMS 5 minutes before an event occurs, as well as a popup notification an hour before the event. Once you have the latest version of Python, you need to get the GData Python module, ElementTree Python module, and dateutil Python module. Links for all these are here. After installing all the pre-requisites, get gcalcli from the gcalcli project page on google code. I put gcalcli in ~/Documents/scripts/gcalcli. You'll also want to edit this file, entering your login information (email, password). With all this stuff setup, creating a reminder for myself is super easy: I just hit ⌘ Shift i to open iTerm (see Setup Global Keyboard Shortcuts to Open Any App with Quicksilver), then type q '9pm write blog post about gcal' and I have captured the thought and can get it out of my mind and focus on whatever task is at hand. One final addition I just made to my Gcal setup is making SMS Quick Add events easy. If you have Google Calendar setup with your mobile phone, you can text 9pm write blog post about gcal to 48368 to quick add an event / reminder. I added 48368 to my phonebook under "Google Calendar" to make adding reminders from my phone almost as easy as doing it from my computer. The problem I've had with most reminder / todo software in the past is that it's too hard to enter tasks or reminders; hence, I'd always give up on using them and revert to pencil and paper. My new Gcal setup makes capturing ideas super easy, so I think I'm gonna stick with it for a while.